Food labels should contain more detail about how much sugar is in a product, the US FDA has declared. The measure is part of a broader overhaul of the ubiquitous Nutrition Facts label, which has remained unchanged for two decades. 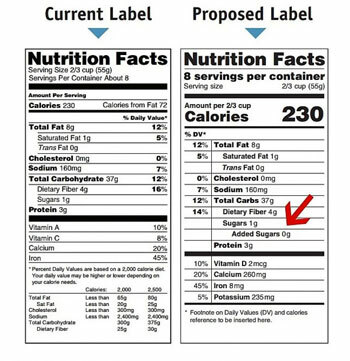 The FDA first proposed the new requirements last year when it unveiled a host of suggested changes to current food labeling. At the time, it proposed only that companies list the amount of added sugar in each product. This latest proposal expands that requirement to include additional information about the daily intake percentage. 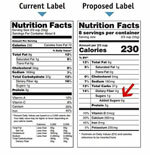 “The FDA is also proposing to change the current footnote on the Nutrition Facts label to help consumers understand the percent daily value concept. In addition, the FDA is releasing results of its consumer studies on the declaration of added sugars and the footnote,” the agency said. The FDA said it will receive comments on its latest proposal for 75 days. But it didn’t take nearly that long for sharply divided reactions to roll in from consumer and public health experts, who see the move as critical in helping combat the nation’s obesity epidemic, and from major food industry associations, which argue the disclosures are misguided. The Sugar Association, which represents some of the nation’s largest sugar producers, said in a statement that the FDA’s latest proposal is based on “limited and weak scientific evidence” that doesn’t meet the agency’s own standards. Other industry groups, including the American Beverage Association, the Corn Refiners Association, International Food Information Council and the Grocery Manufacturers Association, also have questioned the push to label added sugars, suggesting that the change could be onerous to implement and likely to confuse consumers rather than help them. Michele Simon, a public-health attorney and consultant who has been an outspoken critic of the nation’s food industry, called such complaints a “smoke screen”. The new labels, if enacted, could indeed lead to some striking information about the amount of sugar that Americans routinely consume. For instance, the FDA said that based on existing evidence, it plans to set 50 grams of added sugars as the recommended daily value for an average adult. Therefore, a person who consumes a 20oz (591ml) sugary drink might now see on the label that it contains 66 grams of sugar — or 132 percent of the daily value. In addition to the requirements around added sugars, the overhauled Nutrition Facts label unveiled last year would include more than a half dozen significant changes, including more prominent calorie counts and more realistic serving sizes. The labels are found on roughly 700 000 products.